Fig. 1. View through a laser cut panel. Fig. 2. Close up of laser cuts reflecting blue skylight upwards. Used in windows to redirect sunlight and skylight to the ceiling. Used in skylights to admit low elevation light and reject high elevation light. Manufactured by laser cutting sheet acrylic in the thickness range 2mm-20 mm. Powerful redirection of off-normal light, typically redirected through angles > 90o. Good viewing transparency in the near normal direction. Relatively low cost - about $200 per square metre, $18 per square foot. An automatic laser cutting machine is programmed to make an array of parallel cuts through or partly through a transparent sheet of acrylic plastic, see Fig 2. above. The cuts are made at spacing D to a depth W and at angle t. The air to material interface at the walls of the cuts become internal mirrors that reflect by total internal reflection. The sheet may be partly cut through leaving one face solid. E.g. the panel in Fig 1 is cut in 10 mm acrylic to depth W = 6 mm and spacing D = 4 mm. Light at incidence angle i is refracted into the material at angle r. The fraction, fd, of this light that encounters the surface of a laser cut is redirected. The remaining fraction, fu, (fu = 1 - fd), is transmitted without deviation. The equation for fd is a relatively simple function of D, W, t and the refractive index n and may be found in the paper "Performance of laser cut light deflecting panels in daylighting applications." Solar Energy Materials and Solar Cells 29, 1-26 (1993). How a panel redirects light in the simple case of normal cuts (t = 0) is illustrated below. Fig 2. Illustrating redirection of light in a laser cut panel. Fig. 4. Fraction of light redirected, fd, versus incidence angle. D/W = 0.7, t = 0. When the angle of incidence i = 0 all light is transmitted without redirection, fd = 0, and the material has good viewing transparency, see Fig 1 above. As the angle of incidence increases the fraction of light redirected, fd, increases until at angle of incidence i = i0 all light is redirected. Beyond i0 the fraction redirected is less than 1.0. The graph shown above is typical and is the basic design curve for working with laser cut panels. Sunlight is incident on a window at a wide range of angles depending on the time of day and season and for each incident angle a corresponding fraction will be redirected. As some sunlight passes directly into the room careful design is required to ensure the sunlight does not result in over heating or glare. See : USING LCP. 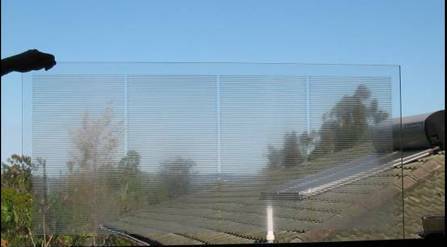 An example of design that takes seasonal variation of incidence into account is illustrated by an installation of laser cut panel as a vertical glazing in St Paul's School in Brisbane. Most of the time some sunlight passes directly through a fixed laser cut panel. This can cause problems with glare on work surfaces. This problem can be eliminated by using a second laser cut panel to redirect all light upwards - a development known as light channeling panel. The problem can also be addressed by using laser cut panel in a moveable window such as a hung window that can be tilted so that sunlight is incident at the angle, i0, at which all sunlight is redirected to the ceiling. 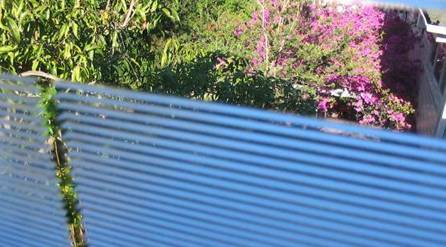 This works well on South facing widows in the Northern hemisphere (and North facing windows in the Southern hemisphere) as the angle of incidence (projected on the vertical plane) is nearly constant during the day. Thus the hung window needs to be adjusted only once every few days. If the hung window is on East or West facades the tilt of the window needs to be adjusted a several times a day in order to redirect most of the sunlight. An example of laser cut panels in hung clerestory windows is the installation at Kenmore South State School, Brisbane, shown below. Here laser cut panels are fixed by clips as a second glazing inside the hung clerestory windows. The hung windows are manually tilted by a chain linked control that has a handle on the central column on the left hand wall. The lower windows and glazed doors are shaded by a veranda that extends outwards to the left. The hung clerestory windows extend above the veranda and are not shaded by any overhang. These windows are tilted outwards by the manual control to an angle at which all incident sunlight is redirected by the laser cut panels. 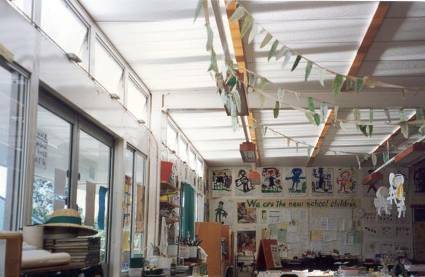 Fortunately this angle corresponds roughly to the angle at which light is redirected near horizontally across the ceiling providing good penetration of natural lighting into the classroom. In the installation shown the penetration of sunlight is somewhat compromised by the wooden bearers that run across the ceiling parallel to the windows. Without the laser cut panels in the windows the area below the hung windows would be severely compromised by direct sunlight glare and an alternative means of shading would be required. The tilted laser cut panel is used in the light re-directing awning LRA. COMMERCIAL : US Patent 4,989,952, Australian Patent 601634, UK Patent GB 2240576. Commercial partners in the US and Australia are sought to manufacture and market this product under license. Home ---- light channeling panel.